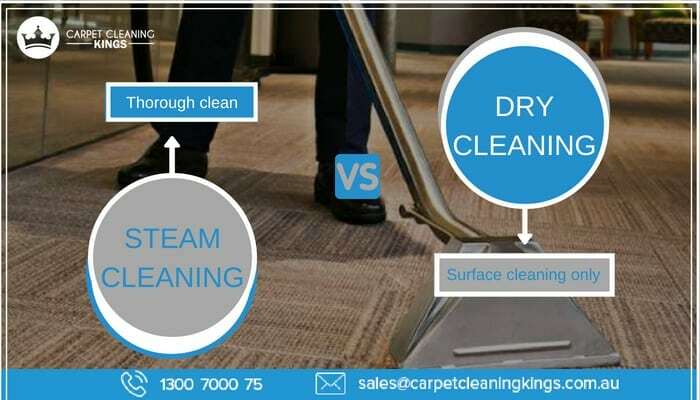 If you’re looking to have your carpet cleaned then there are two main choices – steam cleaning or dry cleaning. Most carpet cleaning companies have neither the skills nor the equipment to operate both systems and naturally promote just the service they operate. This means that prospective customers are kept in the dark about which system is best for their carpet. The truth is not so much about which system is best – there’s definitely a place for both – but which is more appropriate depending upon circumstances. Its no wonder that hot water extraction steam cleaning is the preferred method of cleaning by Carpet Cleaning Kings, most carpet cleaners and carpet manufacturers. Most people when they refer to steam cleaning actually mean hot water extraction since there is actually little or no steam involved in this process. In this procedure the carpet is first given a thorough vacuum to remove any dirt and debris. Meanwhile hot water is heated in a truck mounted cleaning machine. Trained carpet cleaning professionals then use a powerful cleaning machine to inject hot water and a cleaning solution into the carpet. The force helps to loosen any dirt and grime (sometimes helped by agitation) after which the same machinery is used to extract the dirty water and residues from the carpet. The carpet is then left to dry naturally for a few hours. Although there may be signs of steam coming from the water, it’s actually the water that’s doing the cleaning and not the steam. This type of cleaning is very thorough and is recommended by most carpet manufacturers. The obvious drawback is that the carpet needs to dry out before it can be walked on. Factors that determine how quickly the carpet dries include the air temperature, airflow, humidity, amount of water used, and the proficiency of the carpet cleaner. If the carpet is taking several days to dey then far too much water has been used. There are a few systems which fall within this category but basically they all involve chemicals (and a small amount of moisture) which are sprinkled in the form of crystals or sprayed onto the carpet as a liquid. The carpet is left for a while while the crystals or liquid absorb any dirt or dust, after which the carpet is given a thorough vacuum to remove the residues. This type of system is best for surface cleaning only and doesn’t do a deep clean like steam cleaning does. It’s ideal for maintenance cleaning and is popular with hotels and offices. Steam cleaning is probably the way to go if your carpets are heavily soiled and you have a few hours to spare. Dry cleaning, on the other hand, is better suited to carpets that are lightly soiled or simply need freshening. The main advantage of this type of carpet cleaning is that the carpet can be walked on right away, making it ideal for foyers and bedrooms in hotels as well as for reception areas and individual rooms in office blocks. Steam cleaning can also involve heavy equipment and sometimes it can be difficult getting this into high rise buildings. So hopefully you can see that both steam and dry carpet cleaning are good methods of carpet cleaning when they’re used appropriately. It’s also key to hire a carpet cleaner that knows how to get the best results for whatever method of carpet cleaning that’s being deployed. At Carpet Cleaning Kings we use the hot water extraction method for cleaning domestic and commercial carpets. Our experienced, skilful technicians understand carpets and have the know-how to get your carpets looking almost as good as new once more. Contact us today on 1300 7000 75 to request a free quote or to book an appointment.